Acute renal failure (ARF) is a common complication in patients with decompensated cirrhosis. The traditional diagnostic criteria of renal failure in these patients were proposed in 19961 and have been refined in subsequent years.2 According to these criteria, ARF is defined as an increase in serum creatinine (sCr) of ≥50% from baseline to a final value >1.5 mg/dL (133 µmol/L). However, the threshold value of 1.5 mg/dL (133 µmol/L) sCr to define renal failure in patients with decompensated cirrhosis has been challenged.3 ,4 In addition, the timeframe to distinguish acute from chronic renal failure has not been clearly identified, the only exception being type 1 hepatorenal syndrome (HRS). Meanwhile, new definitions for ARF, now termed acute kidney injury (AKI), have been proposed and validated in patients without cirrhosis.5–7 Recently these new criteria were also proposed and applied in the diagnosis of AKI in patients with cirrhosis.3 ,8–15 Thus, in December 2012, the International Club of Ascites (ICA) organised a consensus development meeting in Venice, Italy, in order to reach a new definition of AKI in patients with cirrhosis. The discussion among the experts continued thereafter for 2 years, both online and through several meetings, between those experts who had different positions on crucial points on the subject. This paper reports the scientific evidence supporting the final proposal of a new approach to the diagnosis and treatment of this condition, on which the experts agreed. In recent years, diagnostic criteria have been proposed for the diagnosis of ARF in non-cirrhotic patients, now termed AKI. In particular, two separate bodies developed and published two consensus definitions of AKI: the Acute Dialysis Quality Initiative group for the Risk, Injury, Failure, Loss of Renal Function and End-Stage Renal Disease (RIFLE) criteria; and the Acute Kidney Injury Network (AKIN) group for the AKIN criteria (table 1).5 ,6 More recently, a panel of experts has suggested combining part of the AKIN criteria (increase of sCr of 0.3 mg/dL (26.5 µmol/L) within 48 h or by ≥50% from baseline together with a reduction in urine output to <0.5 mL/kg/h for >6 h) with part of the RIFLE criteria (increase of sCr ≥50% within 1 week or a reduction in GFR by >25% together with a reduction in urine output to <0.5 mL/kg/h for >6 h), thus leading to the proposal of the Kidney Disease Improving Global Outcome (KDIGO) criteria7 (table 1). However, the use of a reduction of urine output in patients with cirrhosis and ascites as a diagnostic criterion is a problem, since these patients are frequently oliguric with avid sodium retention and yet may maintain a relatively normal GFR.24 Conversely, these patients may have an increased urine output because of diuretic treatment. Thus, urine collection is often inaccurate in clinical practice and the use of kinetic changes in sCr becomes the crux of the definition for the diagnosis of AKI in cirrhosis. However, the cut-off value of 1.5 mg/dL (133 µmol/L) still has important resonance with many clinicians. Two prospective studies have recently shown that a cut-off value of sCr of 1.5 mg/dL (133 µmol/L) is useful to predict progression of AKI and consequently the prognosis in patients with cirrhosis.9 ,10 Thus, an sCr ≥1.5 mg/dL (133 µmol/L) was the only predictive factor for progression of the initial AKI stage (AKI stage at the first fulfilment of AKIN criteria) to a higher AKI stage during hospitalisation (peak AKI stage). Thereafter, it was also shown that the cut-off value of sCr ≥1.5 mg/dL (133 µmol/L) was important when patients with peak AKI stage 1 were considered. In fact, patients with AKI stage 1 could be divided into two groups: those whose peak sCr did not exceed 1.5 mg/dL (stage 1-A), whose short term mortality might be similar to those without AKI and in whom regression might occur more frequently;9 ,10 and those whose peak sCr exceeded 1.5 mg/dL (stage 1-B), whose short term mortality was higher than those without AKI.9 ,10 Patients with AKI stage 2 and 3 have the highest mortality.8–10 However, whether these observations can be generalised to all hospitalised patients with cirrhosis should be assessed in future studies. In fact, as far as the impact of peak AKI stage 1 on in-hospital mortality, it has recently been observed that in patients who developed AKI as a consequence of a bacterial infection, those with stage 1 AKI and a final sCr ≤1.5 mg/dL (133 µmol/L) had a higher short term mortality compared to those without AKI.13 ,27 In addition, regarding regression of AKI stage, it has recently been observed (in non-hospitalised patients) that despite resolution of most AKI episodes in patients with advanced cirrhosis, a gradual and significant increase in sCr and a gradual reduction in mean arterial pressure were observed during follow-up, associated with a significant reduction in mid-term survival compared with non-AKI patients.11 Indeed, the main lesson learnt from the application of AKIN criteria is that even a small increase in sCr should be identified as early as possible for potential early interventions. Why do we need to change the conventional diagnostic criteria for AKI? A recent editorial on the topic of AKI in cirrhosis28 asked the question: “Should we change current definition and diagnostic criteria of renal failure in cirrhosis?” Currently, studies on AKI in patients with cirrhosis showed that AKI defined by an absolute increase in sCr ≥0.3 mg/dL (26.5 µmol/l) and/or ≥50% from baseline is associated with a higher probability of the patients being transferred to the intensive care unit, a longer hospital stay, and an increased in-hospital as well as 90-day and mid-term mortality.8–15 On the basis of this evidence, all the experts agreed that it was time to change our current definition of renal failure by introducing a modified version of the KDIGO criteria for the diagnosis of AKI in patients with cirrhosis (table 2). In the new ICA criteria for the diagnosis of AKI, the use of urine output as one of the criteria has been removed since it does not apply to patients with cirrhosis (ie, many patients are oliguric but have preserved kidney function) and it has never been investigated. Further, two other changes to the KDIGO criteria were adopted, namely: (1) a sCr within the last 3 months before admission is considered a baseline value for the diagnosis of AKI when a value within the previous 7 days is not available; and (2) the calculation of the baseline sCr by the reverse application of the Modification of Diet in Renal Disease (MDRD) formula, using an arbitrarily defined normal value of GFR of 75 mL/min/1.73 m2, was not included. These two points are specifically discussed in the next section. The first step in applying the ICA-AKI criteria is to define a baseline sCr. It has been stated that a renal disease process that results in a change in sCr over several weeks cannot be defined as AKI, although it may still represent an important clinical entity.7 Nevertheless, as with any clinical scenario, the timeframe for the definition of AKI is somewhat arbitrary, and it is mainly suitable for the diagnosis of AKI in hospitalised patients using a sCr value on or after admission as baseline (hospital-acquired AKI). However, as in the general population, many patients with cirrhosis can develop AKI before admission to hospital (community-acquired AKI). Indeed, in previous studies where pre-admission values of sCr were used as baseline, the rate of AKI was higher than in those based on sCr on admission as baseline (47% vs 26%).9 ,10 Thus, the diagnosis of community-acquired AKI on admission is related to two possible scenarios: (1) the patient with an available sCr value before admission; and (2) the patient without an sCr value before admission. The use of pre-admission values of sCr poses a great dilemma: how far back can a baseline value of sCr be retrieved and still be expected to be ‘valid’ for the definition of AKI? In the general population, it is reasonable to assume that sCr will be stable over several months or even years, so that an sCr obtained 6 months or even 1 year previously would reasonably reflect the patient's premorbid baseline.7 ,29 In patients with cirrhosis, an application of a more rigorous time frame for the definition of AKI seems even more important. In fact, in these patients, impairment of renal function may progress gradually as they go from a compensated to a decompensated state and then more rapidly as the decompensated state worsens. In addition, it should be considered that almost all patients with cirrhosis and ascites receive diuretics that can transiently impair renal function and, thus, increase sCr. 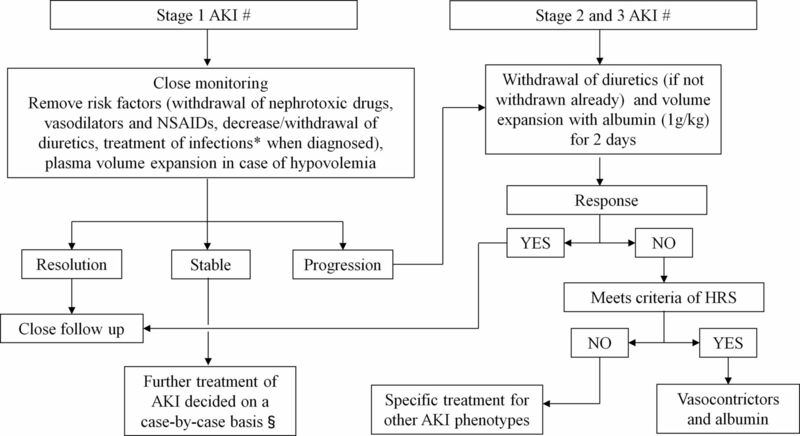 According to the new ICA-AKI diagnostic criteria for AKI, we propose a new algorithm for the management of AKI in patients with cirrhosis (figure 1). The algorithm is based on the new staging of AKI. Proposed algorithm for the management of acute kidney injury (AKI) according to International Club of Ascites—AKI (ICA-AKI) classification that combines Kidney Disease Improving Global Outcomes (KDIGO) criteria and conventional criteria in patients with cirrhosis and ascites. Most of the experts had concerns about the use of vasoconstrictors in patients with AKI stage 1 and sCr <1.5 mg/dL. For the definition of close follow-up, and/or case-by-case, see the text. *Treatment of spontaneous bacterial peritonitis should include albumin infusion according to current guidelines. #Initial AKI stage is defined as AKI stage at the time of first fulfilment of the AKI criteria. §No global consensus was reached on this point. HRS, hepatorenal syndrome; NSAIDs, non-steroidal anti-inflammatory drugs; sCr, serum creatinine. Prompt recognition and early treatment of bacterial infections when diagnosed or strongly suspected. Patients who respond with a return of sCr to a value within 0.3 mg/dL (26.5 µmol/L) of the baseline value should be followed closely (assessment of sCr every 2–4 days during the hospitalisation and checked as outpatients at least every 2–4 weeks during the first 6 months after the discharge) for early identification of potential new episodes of AKI.11 In those cases where there is progression of the AKI stage, the patients should be treated as patients who present with ICA-AKI stage 2 and 3. This treatment should include the withdrawal of diuretics, if this had not been previously implemented, as well as the expansion of plasma volume with intravenous albumin at the dose of 1 g per kg bodyweight per day for two consecutive days, in order to treat pre-renal AKI and to allow differential diagnosis of AKI (box 1). The maximal dose per day of albumin should not exceed 100 g as previously suggested.2 Further management of patients who do not respond to diuretic withdrawal and plasma volume expansion will obviously depend on the final diagnosis of the AKI type and, pragmatically, on the differential diagnosis between an HRS-AKI, an intrinsic AKI, and post-renal-AKI (box 1). Thus, another major contribution of this new algorithm is to accelerate the differential diagnostic process among the different types of AKI. However, it should be highlighted that several steps of this algorithm are not based on evidence but just on experts’ opinion, and that it should be validated in future prospective clinical studies. In particular, in patients with AKI stage 1 who do not respond but who do not progress to a higher stage, no consensus was obtained among the experts on the specific treatment. All experts agreed to treat these patients according to the right side of the algorithm when the final value of sCr is ≥1.5 mg/dL (133 µmol/L). Some experts favour the treatment of patients with AKI stage 1 and sCr <1.5 mg/dL (133 µmol/L) in the same way. However, most of the experts did not agree on this because they had concerns about the early use of vasoconstrictors (terlipressin or norepinephrine or midodrine plus octreotide) in these patients in case of HRS-AKI. Thus, further clinical controlled studies are needed to address this relevant issue. In the meantime, decisions about the treatment of these patients should be taken on a case-by-case basis evaluating the aetiology of AKI, the presence or absence of precipitating factors, other organ failures, or comorbid conditions that may contraindicate treatment. *Patients who fulfil these criteria may still have structural damage such as tubular damage. Urine biomarkers will become an important element in making a more accurate differential diagnosis between HRS and acute tubular necrosis. ICA, International Club of Ascites; NSAIDs, non-steroidal anti-inflammatory drugs; RBCs, red blood cells. Why do we need to change the diagnostic criteria of HRS in the setting of AKI? A major critical point in the management of AKI in patients with decompensated cirrhosis is whether the diagnostic criteria of type 1 HRS should be revised in light of the new definitions of AKI. The current criteria include a time interval (2 weeks) over which sCr must double to a value >2.5 mg/dL for the diagnosis of type 1 HRS.1 ,2 A revision of these criteria is needed because the current definition of type 1 HRS does not allow physicians to initiate potentially effective treatment, specifically vasoconstrictors and albumin, until the sCr increases to ≥2.5 mg/dL. Since it has been observed that in patients with type 1 HRS, a higher sCr at the beginning of treatment leads to a lower probability of response to terlipressin and albumin, the most investigated and effective treatment of type 1 HRS,33 ,34 it seems prudent not to wait until the sCr increases beyond 2.5 mg/dL before starting the treatment. According to the new proposed algorithm, when AKI is characterised by an initial ICA-AKI stage 2 or 3 or by progression of the initial stage despite general therapeutic measures, patients who meet all other diagnostic criteria of HRS provided by the previous definition2 should receive vasoconstrictors and albumin, irrespective of the final value of sCr. This makes it possible to remove a barrier to the achievement of a pharmacological response that was linked to the rigid sCr cut-off value of >2.5 mg/dL in the definition of type 1 HRS. The potential advantage of the algorithm is that its application may allow earlier treatment of patients with type 1 HRS, leading to a better outcome as compared with the current approach. However, we lack studies where vasoconstrictors were used in the treatment of HRS with lower values of sCr, and caution should be exercised in the use of vasoconstrictors in these patients pending further controlled trials. Nevertheless, all the experts agreed on the removal of a fixed cut-off value of sCr from the diagnostic criteria of HRS. This is the only change that they wanted to introduce in the current diagnostic criteria for HRS. As a consequence, all the remaining criteria are maintained (box 1). However, these criteria do not rule out the possibility of renal parenchymal damage.35 Thus, all the experts agreed on the potential role of new urinary biomarkers in the differential diagnosis of the different types of AKI in patients with cirrhosis. Several urinary biomarkers of tubular damage, such as neutrophil gelatinase-associated lipocalin (NGAL), kidney injury molecule-1 (KIM-1), interleukin-18 (IL-18), and liver fatty acid-binding protein (L-FABP), have been discovered in recent years. Preliminary experiences from Europe and the USA showed that the use of NGAL36 and/or the combination of urinary biomarkers (NGAL, KIM-1, IL-18, L-FABP and albuminuria)37 may be useful in the differential diagnosis of AKI in patients with cirrhosis. These findings need to be confirmed in future studies. The removal of a fixed cut-off value of sCr from the diagnostic criteria of HRS in the setting of AKI has important implications in the management of these patients. Thus, there is a need to change the definition of response to the pharmacologic treatment of HRS. Full response will be defined by return of sCr to a value within 0.3 mg/dL (26.5 µmol/L) of the baseline value. Partial responses will be defined by a regression of at least one AKI stage with a fall in the sCr value to ≥0.3 mg/dL (26.5 µmol/L) above the baseline value. Nevertheless, we should recognise that preliminary data suggest that even a partial decrease of sCr from baseline may be associated with improved short term survival, irrespective of whether or not the patient achieves HRS reversal (sCr <1.5 mg/dL).38 These data suggest that the degree of improvement in sCr may be more relevant than achieving a finite level of renal function. The definitive removal of any cut-off value of sCr from the criteria for diagnosis of HRS in the setting of AKI, but maintaining the remaining previous criteria (box 1). In summary, the results of the latest consensus conference of the ICA introduces a new dynamic definition of AKI in patients with cirrhosis, on which a new treatment algorithm is based, representing a substantial change from the traditional criteria used until now in the definition of AKI and type 1 HRS.
. Diagnosis, prevention and treatment of the hepatorenal syndrome in cirrhosis: a consensus workshop of the International Ascites Club. Gut 2007;56: 1310–18.
. A randomized, placebo-controlled, double-blind study to confirm the reversal of hepatorenal syndrome type 1 with terlipressin: the REVERSE trial design. Open Access J Clinical Trials 2012;4:39–49. Contributors Organisation of the meeting: PA; Analysis of data from the literature: PA, PG, FW, MB, TDB, AG, RM, RJ, SKS, SP, KM, SSL, FD, FS, PC, WRK, VA, GG; Drafting and writing the manuscript: PA, PG, FW, MB, SP, GG; Critical revision of data and manuscript revision: PA, PG, FW, MB, TDB, AG, RM, RJ, SKS, SP, KM, SSL, FD, FS, PC, VA, GG. Funding PG: Research funding from Sequana Medical, Grifols SA; Consultancy Advisor to Ferring Pharmaceuticals; Competitive Public Grant Funding from: Fondos de Investigación Instituto de Salud CarlosIII (FIS12/0330) and Agència de Gestió d'Ajuts Universitaris i de Recerca (2014 SGR 708). MB: Consultant to CSL Behring GmbH, Baxter Healthcare SA; speaker to Behring GmbH, Baxter Healthcare SA, PPTA Europe. AG: Consultant to CSL Behring. RJ: Consultant to Ocera Therapeutics Inc, Conatus Pharmaceuticals Inc; Research grant from: Grifols Inc, Gambro AB, Sequana Medical AG, Norgine BV, Ocera Therapeutics Inc (the latter five companies are all involved in research collaboration); Speaker to Grifols Inc; Norgine BV; Inventors of Ornithine Phenylacetate licensed by UCL to Ocera Therapeutics; UCL spinout Yaqrit which will in-licence five of the following inventions in which R Jalan is the main inventor: YAQ001 nanoporous carbons for prevention of gut bacterial translocation, UCL liver dialysis device, DASIMAR biomarker for liver failure, Neutrophil for test: biomarker for predicting infection in decompensated cirrhotic patients, Urinary toll-like receptor 4: for differential diagnosis of renal dysfunction of cirrhosis. SSL: Consultant to Ikaria and Grifols. PC: Lecturer to Baxter Healthcare SA, Kedrion, Grifols. VA: Received grant and research support from Grifols. Editors' note This article is being published jointly in Gut and Journal of Hepatology. © 2015 BMJ Publishing Group Ltd, British Society of Gastroenterology and European Association for the Study of the Liver.